A week ago, many hundreds gathered in San Diego answering Mijente’s call to take grounded and strategic action against family separation, criminalization and further the demand to #AbolishICE. Led by children and babies, a beautiful 2 mile march moved through the streets of San Diego from the historic Chicano Park to the federal buildings. Check out some images from the day here. At the same time, a series of actions were planned to disrupt business as usual while amplifying the urgent message to Free our Families and Stop Operation Streamline. We give thanks for the vision and leadership of Mijente, Movement for Black Lives organizations and San Diego local organizers who made the action possible. 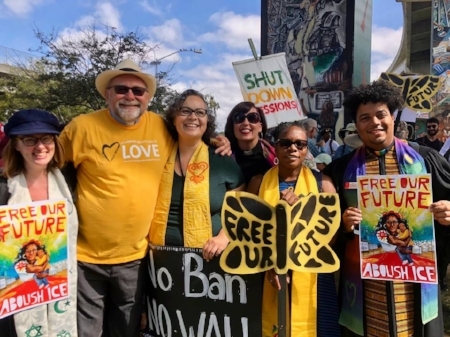 We also had nearly 100 Unitarian Universalists register to be present in San Diego and had many more than that participate, attend or support. Thank you to everyone who sang, made art, blessed, prayed, talked to media, handed out water, locked down federal building where our people are in cages, interrupted immigration court and looked love into the eyes of undocumented folks being charged, dropped a visionary banner, made phone calls, amplified, fundraised, gave your congregational resources, bought snacks, offered vans and home hospitality, explained abolition for the first or thousandth time, loved on each other. Shout out to the San Diego area UU congregations, UU Justice Ministry of California, BLUU, UURISE, the Pacific Western Region, and the UUA Board of Trustees for all of your support. Follow Mijente, text ABOLISHICE to 797979 to stay in touch with next steps in the campaign. Go deep in the vision of how we can free our future here. Mijente pulled together this beautiful policy platform. It gives helpful grounding for anyone who wants to learn more about what it means to say #AbolishICE and what’s needed to make it possible. Give gratitude to all who have made this work possible. Say thank you to your people who helped you show up, to the organizers who called for this way before it was on twitter and in politician’s mouths. Check out some of the history so we can responsibly know has paid the price for getting us to this point of courage and resistance. Check out Luna Syenite’s Imagine Alternatives to Policing as a short series of specific alternatives to policing that we can create and live in today - expanding our imagination and inviting us to embody different practices of justice and restoration. For some of us AbolishICE feels like love in action. For others of us, it feels new and maybe hard to get our heads around. If you like facts and policies and bad jokes, consider this explanation from an immigration attorney. We anticipate being in this work with you together - as we dive deeper into the work of transformation, our collective stake in abolition and our faithful mandate to offer our skills and ourselves to movement.